I received these complimentary products for review purposes with no compensation. All opinions are 100% mine and 100% true. I have an unnecessarily huge eyeshadow stash, second only to my mascara collection. I find eyeshadow one of the most fun parts about applying makeup because you can do so much with it! Eyeshadow designs are as limitless as your imagination. Granted, I don't have the skill to ever achieve any of these looks, but you get the point. 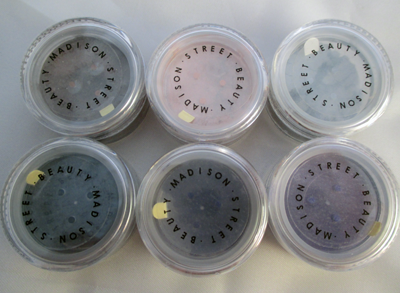 If you want to attempt any of these looks, you can do so with Madison Street Beauty All-Natural Mineral Eyeshadows. You will see why soon. Madison Street Beauty's goal is simple: they want to make natural beauty products as accessible and affordable as possible. They believe that "you don't have to pay the earth to get the highest quality products that don't hurt you or the environment." Their eyeshadows are all handmade! Their eyeshadows claim to be highly pigmented, crease-resistant, and easily blendable. 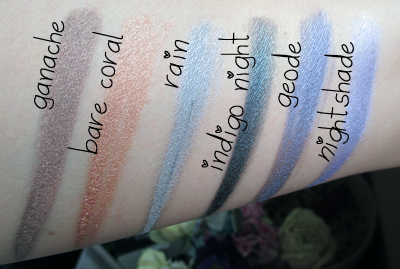 The shades that I chose to review are Ganache, Bare Coral, Rain, Indigo Night, Geode, and Nightshade. These swatches were photographed in natural lighting. Ganache is a chocolate brown. Bare Coral is a golden brown with some pink in it, perfect for a neutral eye. Rain is a fancy name for silver. 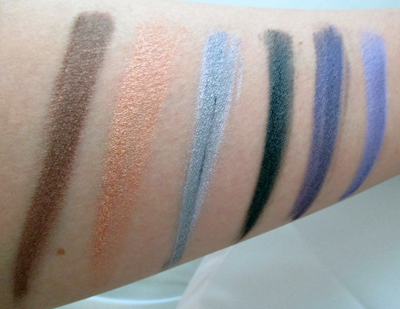 Indigo Night, Geode, and Nightshade are variations of purple, perfect for an ombre eye. These swatches were photographed in artificial lighting. As you can probably tell, they are extremely pigmented. 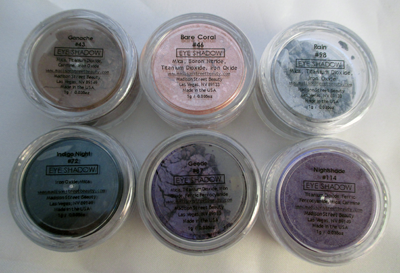 As expected from the swatches, these eyeshadows are incredibly pigmented. They're probably one of the most pigmented eyeshadows that I've tried especially for being handmade. They also glide on beautifully and silky, making them heavenly to blend. There was also surprisingly minimal fallout, which I really appreciated. Another plus is that they really don't crease and are long-lasting. That's a lot more than I can say for most brands, big or otherwise. I have nothing but nice things to say about these eyeshadows. If I had to comment on a flaw, it would be about how messy they can be to use. This is a personal preference of course; I'm not a fan of loose powder products for this reason. I will probably do an FOTD soon to show these babies in action. Madison Street Beauty is definitely a great find! Once I get over the hassle of working with loose powder eyeshadows, these could potentially be one of my favorite eyeshadows. I can sincerely vouch for their claims which I mentioned above. Madison Street Beauty also offers other products that are vegan and all-natural as well. They have lip balms, sheer powder, nail polish, blush, bronzers, foundations, and so much more to be discovered! Have you ever attempted eyeshadow design? If you found this review helpful, check out my other reviews. They're so pigmented! I love the look of Indigo Night. Wow! These look gorgeous. I definitely need to try these eyeshadows out. Love the pigmentation of these eyeshadows! The copper colored one is my fave. Love this palette, the colors are so pigmented! I was also wondering if you've heard of Vain Pursuits before? They do personalized skincare and I've been trying to find reviews on their products before buying! I've been hearing lots about Vain Pursuits as well. Been looking for online reviews before purchasing! Beautiful selection of colors! I absolutely love that this brand is handmade and all-natural. Bare Coral looks like the kind of shade that would look great on anyone. It took me a while to decide on these shades because they have such a huge array of gorgeous shades. I wanted to try them all! Are You Guilty of These Common Makeup Mistakes?